Phil Harnage is a US animation writer employed by DiC Entertainment from the late 80’s up until the company’s acquisition by Cookie Jar in 2008. 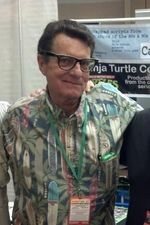 Harnage wrote several episodes of The Super Mario Bros. Super Show! , The Adventures of Super Mario Bros. 3, and Super Mario World. Beside his work on the DiC Mario cartoons, Phil Harnage has been involved in production and writing on many of DiC's animated series, such as Captain Planet and the Planeteers, Sherlock Holmes in the 22nd Century, Street Sharks, and the "Sonic Sez" segments of Adventures of Sonic the Hedgehog. 2.1 The Super Mario Bros. Super Show! This page was last edited on May 20, 2017, at 18:29.